Aragonite forms the skeleton of a number of marine organisms, either living or recently fossilised. Beautiful reddish Aragonites come from Molina de Aragon, Spain. The most popular forms of Aragonite for metaphysical use are the reddish Aragonite Star Clusters found in Morocco and the stunning Blue Aragonite specimens which have recently come out of China. Other Aragonites occur in Italy, Greece, Austria, England, Czech Republic, Mexico, Peru, Pakistan and the USA. 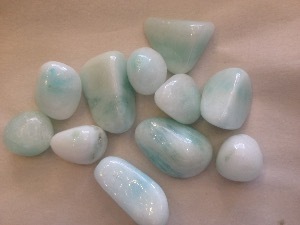 Blue Aragonite is said to improve emotional perspective and healing. It helps one to speak and think compassionately and to heal from verbal abuse. It may assists one in overcoming hesitation or fear of speaking and sharing one’s ideas and thoughts with other. Physically Blue Aragonite is said to help with respiratory illnesses or weaknesses, especially those involving inflammation. It may stimulate the lungs and is useful in breath work, prone yama or other deep-breathing practices. Blue Aragonte tumbled to a smooth finish, an ideal pocket size stone, small enough to carry around with you. Tumble Stones can also be placed around the home for their energies or can just be nice decorative items. 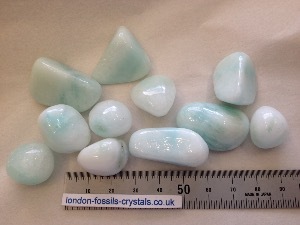 Blue Aragonte crystal gemstones of varying sizes selected specially for your order.